The Avant-Garde Flatware 18/8 collection from TigerChef has a soft, smooth finish that will match any table decor. Its extra heavy weight 18/8 stainless steel construction makes it feel sturdy in your hands and makes it durable enough for dishwasher use. 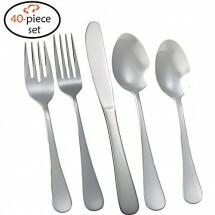 The Avante-Garde flatware set is available with service for 4, 8 and 12 and comes with dinner forks, salad forks, dinner spoons, dinner knives and teaspoons.